1. What do you wear? c) Tuxedos (tuxedo jacket and pants, black bow tie, white shirt, dress shoes). 2. How many songs are on your song list? - We have more than 400 titles on our song list. Please visit our song list page for details. 3. Which styles do you cover? 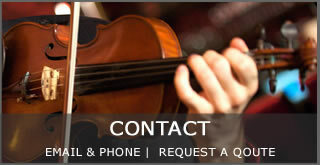 - We cover a wide range of styles (Classical, Jazz, Pop/Rock, World Music, etc.) Please visit our song list page for details. 4. Do you have a song list from which we can select the songs? - Yes, we have a song list with more than 400 pieces on it. You can get it from this website or by email. Just email us with a request - we will quickly reply with the song list. 5. Do you assist the clients with the song selection? - Yes, we will gladly assist you with the song selections. If you are looking for suggestions for the wedding ceremony, we will happily make recommendations. 6. We aren't sure which songs to select. Can you do it for us? - Yes, we would gladly select music for all parts of your event and / or all the songs for your wedding ceremony at your request. 7. Do we also need to select the specific songs for the prelude music and cocktail hour / reception? Bridal Recessional - Wedding March, Mendelssson. 3) Cocktail hour - upbeat mix of jazz and world music (Tangos, Irish, gipsy Jazz). 8. My event is very simple / low key. Do I need to answer all of your questions about the song selections? - No, you do not have to select all of the songs for us. As a matter of fact we prefer to just get the general stylistic suggestions (see the previous answer). You can also just leave the music choices entirely up to us – we have done it numerous times and it always works great! 9. On your song list I saw certain songs that I wouldn’t want you to play at my event. Is it ok to send you a list of songs that I do not want you to play? - Yes, absolutely. As you noticed, we have a very wide selection on our song list, and there are a lot of pieces in many different styles. We understand that you have your stylistic preferences and it is our pleasure to follow them precisely! Please send us a list of tunes that you do not want us to play. 10. Do you have demo recordings of all the songs that are on your song list? - We have recorded more than 50 tracks in contrasting styles. This is a lot more than any other group offers. All of them are available to listed to on our demo page. Since we have more than 400 songs on our song list it would be impossible for us to have all of them recorded. 11. Can you make a quick recording of a specific song that you are preparing for our event and email it to us? - Unfortunately we do not have the capacity to record songs on request. When we record our albums / tracks we do it at some of the best studios in the world. It is a costly and long process. That is why we all enjoy the highest quality of music on our demo page. Please visit our page with samples for the audio recordings that we have available. If you do not find the desired compositions we recommend to listen to the ones that are available in this style. 12. Which instruments do you offer? - Please click on "ABOUT IST", and then "Instruments" for the complete list of your options with choosing the right combination of instruments. 13. What are the most popular combinations of instruments? - Please click on "ABOUT IST”, and then "Instruments" for the complete list of your options with choosing the right combination of instruments. You will also find suggestions for the most popular combinations. 14. I am thinking to hire a combination of instruments that you offer however you do not have samples of this particular ensemble on your website. Can you make a quick recording of this specific combination of instruments and email it to us? - We offer our clients great flexibility with instruments. That is why it would be impossible for us to have samples of all combinations of instruments imaginable. Unfortunately we do not have the capacity to record specific combinations of instruments on request. Please visit our page with samples for the audio recordings that we have available. You can always ask our professional opinion about the specific combination of instruments that you have in mind. If we think that it might not be the best mix – we will make sure to let you know. 15. Do you need to be fed? - We do not require any food for events that are less than three hours. For events that are 3 hours or longer we expect to receive one hot meal per musician plus a non-alcoholic beverage. 16. For events that are 3 hours or longer why do you need to be fed? - Playing music at the highest level takes a lot of energy and concentration. Most of the events that we provide music for require 1-2 hours of travel plus another hour or so to coordinate everything at the location of the event. If you add in 3-5 hours of playing it's not hard to see that for longer events the musicians need to receive a hot meal in order to continue their performance at the highest level. 17. When do you eat? - We usually eat our meal during one of our breaks. We will gladly follow the time guidelines that you and / or your coordinator will suggest for us about when to eat our meal. On request we can provide elegant background music played through our sound system on an ipod while we are eating. 18. How many breaks do you take (if any)? Upon your request we can provide some elegant background music - usually our own recording to play though one of our amplifiers during our break(s). 19. Do you need to see the location where you will be playing in advance? - We have been in business as a group for more than 12 years. During these years we have provided music for more than 1500 events. We know our set up routine in and out and do it very quickly and efficiently. On the day of the performance we arrive to the location ahead of time to check out the perimeters and set up well in advance. For all of the above reasons we do not need to see the location before the event to guarantee a flawless performance / set up on the day of the event. Most likely we have already played at the location where your event takes place! 20. Can you keep music at a very soft / background level so that people can talk / socialize? - Yes, absolutely. We understand that very often it is crucial to the success of the event that guests can talk / socialize without music overpowering them. We know how to keep it just at the right volume level while still making it sound very elegant. 21. Can you play loud / up beat music so that people can dance? 22. Can you play music for HORA dance? - Yes, absolutely. We provided music for HORA type of dancing at numerous events. We know how to keep the crowd on the floor doing circles, dances with chairs, etc! 23. If you are playing for the whole reception can you function as an MC? 1) We would need the complete and finalized list of all the announcements that you want us to make with the spelling of all the first and last names at least one week before the event. 2) There should be a PA system / amp with a mike at the location. If you are hiring the extended version of our group with the drums, vocalist, etc - then we will provide it and use for the MC announcements. If you are hiring our standard trio that doesn't have a vocalist we can provide the PA system for the additional charge. 24. I saw different musicians in the pictures on the group's website. Who will be playing at my event? - Our group has been in business for more than 12 years. During this period several members have relocated to different cities and left the group. That is why you see different people on some of the pictures. 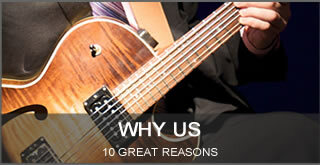 We guarantee you that the current main members of the group will be playing at your occasion. 25. Our event is a very high profile occasion. Can you guarantee us that you will provide the highest level of entertainment as well as professionalism? - Yes, we do guarantee you all these things. We are proud of our continuous reputation as a one of the most professional and entertaining groups in the business. 1. How do we book you? a) You send us a request with the information about your event (see our CONTACT US page). b) We immediately get back to you with the quote. c) If you are ready to book us you should request a contract from us. d) We send you a contract with all the particulars about your event. e) As soon as we receive a signed contract and a deposit from you we are booked and confirmed for your event. f) if you got in touch with us through a website that allows you to pay us the deposit online by credit you can do it any time through that website. 2. How far in advance should we book you / confirm the date with you? - We provide music for 175 - 250 events and concerts every year. We receive 10-20 inquiries for gigs daily! That is why we recommend that you to book us as far in advance as you can. It's not uncommon that we have numerous engagements schedules 2 and 3 years from now. At the same time we always try to accommodate you even if the job request comes only few weeks / days before the event. If we are available we would gladly provide music for you even on a very short notice! 3. When do you need to receive the initial deposit? 4. When do you need to receive the final payment? 2) Another option is to assign somebody reliable to hand in the final balance to us on the day of the event. It is best to do it before the event begins - right upon our arrival to the location. We do require to get paid in cash on the day of the event, though in some exceptional cases we will accept a check. Please let us know beforehand if you plan on paying the final balance on the day of the event by check to get our confirmation / approval. We do need to receive the final payment no later than 15 min after our contracted playing time is over. 5. Do you meet with the clients before the wedding to go over the details? - Most of the time we do not need to meet with the clients before the event. We offer unlimited phone and email consultations as well as very detailed information on this site. If the clients provide all of the necessary information / timelines, etc., we guarantee that everything that has to do with our performance at the event will be perfect. On some very rare occasions we meet with the clients beforehand - when we are providing music for a 6-7 hours long event with multiple intermissions, cues, complex arrangements for music, full band of 8-10 musicians, etc. 6. Can we hear you performing live before booking you? - We have numerous videos of our performances online. You can see a lot of them here, at this website as well as on YouTube.com, vimeo.com, etc. This is the easiest and fastest way to see our performance. We provide music for numerous private events every year. We also play shows that are open to public. Here is what we can offer you. A) If we are playing a concert in your area you are welcome to attend it. Please keep in mind that our concert program might be different from the music that we provide for private events. 1) Email us requesting a list of private events in your area that we will be playing at in the upcoming weeks / months. 2) After receiving the list from us decide which event you would like to attend. 3) We would ask the host of the event to grant you the permission to stop by and attend shortly. 5) Since it's a private event it is very likely that the permission will not be granted. In this case please think about attending another event or show where we will be playing. 7. Could you arrange a private audition for us? - We have been in business for more than 12 years. 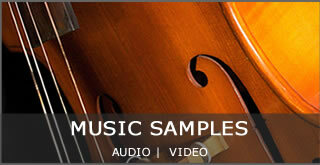 We have numerous samples of our playing online (audio and video). We also receive numerous inquiries for jobs daily. That is why we do not arrange private auditions for our potentialclients. 8. How do you count the performance time frame? - We count our performance time frame from the time when we start playing at your event, per our agreement, until the moment when we play the last note and can pack our instruments and leave the premises. 9. Does the set up time count as performance? - The set up time does not count as a performance time. It is completely on us and hence free of charge to you. 10. Our ceremony is from 3-4pm at the location X. Our cocktail hour is from 5-6pm at the location Z. Do you count this as a 2 hour job or a 3 hour job? - We count it as a 3 hour job. 11. We aren't sure for how long exactly we will need your services. What are our options? - It is a great idea to hire us ASAP for the minimum amount of time for which you are sure you will need our services. We can discuss options / prices / different packages for an increase of the performance time. It's best to finalize all of the exact durations / time frames 2-3 weeks before the event at the latest. 12. We are't sure about the number of instrument that we would like to hire. We are deciding between a duo or trio. What should we do? - We highly recommend to hire at least a duo ASAP. We can discuss options for adding more instruments later. 13. Can we add an instrument after we already booked you? - We always will gladly offer you the desired instrument addition proving the fact that the musician(s) that you would like to add are available for your date. 14. Can we increase the performance time frame after we already booked you? - Yes, absolutely, we will gladly increase the performance time for the appropriate compensation as long as we are available for the extended timeframe. 1. What is your policy about learning the new songs that aren't on your song list? - We are always open about adding new pieces to our song list / preparing one for your specific event. Here is how it works. a) Go over our song list – maybe the desired song is on it! b) If it isn’t on our current song list you should email us the name of the song(s) that you have in mind as well as any additional info about them (band / artist that performs it, name of the composer, etc.) IMPORTANT: Make sure to include a youtube link to the desired version of the piece. d) In any case we will need to have a youtube link to a specific version of the song that you have in mind. You can always email us an mp3 track as well. 2. How do you feel about collaborating for a few songs with a guest musician / vocalist - a friend / relative of the bride / groom / host of the party? - It is ok with us to be joined by a guest musician from the client’s party, it happens quite often. It is important to mention that when collaborating with a guest singer / instrumentalist from the client’s party we do not take any responsibility for the guest musician’s performance. During all the years of being in this business we had some wonderful experiences while playing with the friends of the clients – usually it is when the guest musicians are professionals. We have also had some unfortunate situations when the guest musician couldn’t really play / sing in tune; follow simple cues / read sheet music, etc., that resulted in less than desirable performances. We do not take any responsibility for these rare and unfortunate situations – simply because it wasn’t our decision nor our choice to bring this performer on board. 3. Could you rehearse with a guest singer / instrumentalist? a) Since we are at the location ahead of time to do our set up we will gladly have a quick rehearsal after our set up is done if the time allows is. There is no fee for this option and most of the time it works perfectly. However, since this option is free we cannot always guarantee that there will be enough extra time to go over the material. b) You can hire us for a small fee for 30 extra minutes to do a rehearsal before the event. In this case we guarantee that we will be at the location far ahead of time and offer your guest musician a 30 min rehearsal time. c) You can hire us to rehearse on a different day. This option is rather expensive and most of the time not necessary. 4. What do you need from us in order to perform specific song(s) with a guest performer from our party? a) Which song(s) we will be playing together. You should email us the titles that you have in mind, we would respond with our feedback. b) Which keys they are in – this is especially important when collaborating with a guest vocalist(s). c) We need to make sure we have the same charts / are on the same page with everything. If your guest performers have specific charts they work with they should email it to us. We work with the charts in a lead sheet format (melody and chord symbols). If they have charts in a different format (melody and piano arrangement, etc.) they should email it to us and we would rearrange it for our group for a fee of $25 per song. 1. What time do you arrive to a gig? - We always plan to arrive 45min to an hour before we start playing. We always give ourselves plenty of extra time when traveling long distances. For example: if the event where we are playing is 1 hour away we will be leaving 2.5 hours before the start of our performance. If the event is 2 hours away - we will leave 4 hours before the downbeat, etc. 2. When driving to our event you might hit rush hour. Can you guarantee us that you will be there on time? - Yes, we do guarantee you that we will be there ahead of time. We would like to emphasize that we always do give ourselves plenty of extra time for driving. The longer the distance that we travel, the more extra time we give ourselves. Ex: the destination is 2 hours away; we are leaving 4 hours before the downbeat. The destination is 3 hours away; we are leaving 5.5-6 hours before the downbeat, etc. 3. How do your travel arrangements look like on the day of the event? 1) Leaving our home base at 12.30pm (4 hours before we start playing). This allows us to be at the location well ahead of time even if we hit some traffic. 2) Arriving at the location 45 min – 1.5 hours before the event. 4. How long does it take you to set up? - Our set up is very quick - 5 to 10 minutes total for the trio. If you are hiring a larger band with drums and / or keys and or vocals / PA it does take us to set up longer (30min – 1 hour). In this case we would arrive a lot earlier – 1.5-2 hours before we start playing. 5. My wedding ceremony is about 15-30 min. If we are hiring you for a wedding ceremony only - for how long will we need your services? 10-15 minutes of music after the ceremony. 6. If we are hiring you for a wedding ceremony and cocktail hour - for how long will we need your services? - You should hire us for 2 hours: 1 hour of the ceremony (see the previous answer) and 1 hour of cocktails. 7. My ceremony is a full Catholic Mass. If we are hiring you for this kind of wedding ceremony - for how long will we need your services? - Most of the time a full Catholic Mass takes about 1.10-1.15 minutes. In this case musicians should be hired for at least 1.5 hours, sometimes for 1 hour and 45 minutes or 2 hours just for the ceremony. 8. How many songs do we need to select for the wedding ceremony? c) bridal recessional (as a newly married couple walks back from where the ceremony just ended). Sometimes we play a piece or two during the service. Sometimes we play more than one piece for the wedding party. However, we highly recommend to go with the 3 main pieces (1 - wedding party processional; 2 - bridal processional; 3 - bridal recessional) because it always works best, and helps make bride’s appearance very special. It is also easy to coordinate. 9. Why do you need somebody to give you cues for the wedding processional music? You have played at so many weddings, isn't it obvious when to play the specific music selections for the processional? - We take very seriously everything that has to do with the wedding ceremony, processional and recessional music. After playing at so many events we have learnt that there are no two weddings alike. That is why in order to guarantee you a flawless performance of the desired pieces for the wedding processional, we also require a designated person who will cue us when to start the important song selections. Usually it's the wedding coordinator, the manager at the wedding location or a friend of a family. 10. How do you coordinate cues for the wedding ceremony (processional, recessional, etc)? A) We finalize the important selections for the wedding ceremony with the clients ahead of time. B) We receive a detailed description of who is walking in the wedding party and the bridal processional. C) We ask the clients to assign a specific person to give us cues to start the important musical selection. Usually it's an event coordinator or hotel manager. Sometimes it's a friend of a family or JP. D) On the day of the wedding upon arrival to the location we coordinate the cues with the person who is assign to give us the cues. F) We use the cues from the designated person, common sense and years of experience to determine when to start the important musical selections. 11. How should the cues be given for the processional music? - On the day of the wedding we usually start our performance with playing prelude music. The cue person lines up at the agreed location the entire wedding procession including the bride to start the procession. Once everybody is lined the cue person gives us a simply cue (a thumb up) to start the piece for the wedding party procession. We immediately open the agreed music in our books (it's custom marked beforehand for this event) and start playing it. After the wedding party processional is over the cue person gives us the second cue for the bride. We open the correct piece and play the bridal processional. 12. Do you also need cues for the recessional song? - We communicate the cues for the recessional song with who ever conducts the ceremony (priest, rabbi, JP, friend of the family, etc). 13. We don't have a wedding coordinator. Who should we assign as a person to give you the cues for the processional music? - If you don't have a wedding coordinator or manager at the location to do the cuing it's best to assign this task to a reliable friend who is not the member of the wedding party processional and who has organizing skills. We should know who this person is and communicate with him / her all the cues before the wedding. 14. We are having a rehearsal of the wedding ceremony the night before the wedding. Does your group come to a rehearsal? a) Hire one of the musicians from the trio to attend the rehearsal with a small boom box to see the location and turn the selected music on and off at the right times. b) Hire the whole group to be part of the rehearsal and provide live performance of selected music. 15. Do you take song requests on the day of the event from guests / wedding party / clients? - We always try to accommodate our clients and their guest as best as we can. If we know the song that a guest is asking for and we have chart for it - we would gladly perform it as long as it fits within the stylistic directions given to us by the clients. However we cannot guarantee that we'll be able to perform any given request on the day of the event. 1. Do you play outside? A. We cannot be playing under any kind of rain, even the light sprinkles. B. We cannot play in the direct sunshine, only in the shade. C. We cannot play outside with the temperatures above 95F or below 60F. 2. Do you need an electrical outlet? - We need one electrical outlet somewhere within reach. For the wedding ceremonies we do not require the electrical outlet, though it's still preferred. 3. For our event you will need to relocate from the ceremony location to the cocktail hour location. Is it ok with you? How long does it take you to relocate? - One relocation is ok with us, we do it all the time. It takes us 5-10 minutes to relocate. If you need us to relocate more than once - please let us know ahead of time, we will require a small compensation for the second relocation. 4. How many chairs do you need / what are your performance requirements? 2) for the trio for the cocktail hour / reception location - 4 (four) armless chairs and 1 electrical outlet - both mandatory. 5. Do you provide all of your own equipment that is needed for your performance? - Yes, we do. All we need from you are the chairs and one electrical outlet somewhere within reach. For the wedding ceremonies we do not require the electrical outlet, though it's very much preferred. 6. Can you provide a mike for us during the ceremony and / or reception? - We do not use a mike for our performances in a trio. We amplify our instruments by using pick ups / and amps, not mikes. If you want us to provide a small PA system / speaker with a mike for your event let us know ahead of time. We can rent one for your event from colleagues for a reasonable fee. 7. How much space do you need? - We do not need much space to set up. For the trio performance a minimum of 10 by 6 feet is desired. If you have smaller space in mind for us - please let us know in advance and we will make our best effort to accommodate you. 8. We have a very limited space available for musicians? What are our options? - Please check the previous answer for specific dimensions. We can fit in a very small space, even smaller than our desired minimum dimensions. If there is no way to fit a trio in the designated space you could always hire a duo, or even a solo instrument. Please click on "About IST", and then "Instruments" for the complete list of your options with choosing the right combination of instruments. 9. After we booked you for our event you sent us an email with 10 questions about the event that you have (exact location, duration, etc.) Why do you need to get this info from us and how long in advance do you need it? - We take every job very seriously. That is why we finalize every little detail of the event ahead of time. It's in everybody's best interest to be on the same page with everything (exact duration, location, song selections, etc.) That is why we require to have all of the answers in one email. We need to receive it no later than 1 week (7 days) before the event. In some exceptional cases we can still be finalizing some last minute details closer to the date, however we do prefer to have as many questions answered as possible 1 week before the event. - As soon as we receive the initial deposit we put the job in our schedules and do not accept any other offers for that date / time. In an unfortunate and unlike event that the event we are keeping the deposit that is non-refundable. If the event gets cancelled within 30 days before its date, whole amount should be paid to us, as per our contract agreement. 11. The date of our event changed. Are you available for the new date? What is your policy for change of date situation? - We would make our best effort to accommodate you. We cannot guarantee our availability for the new date. If we are available please be ready to pay an inconvenience fee for the change of date situation. 12. The time frame of our event has moved. What is your policy about the shifting time frame? - We always make our best effort to accommodate you. However, as our contract says, we cannot guarantee you our availability for the new timeframe, only for the timeframe that we originally agreed upon. It is not uncommon that we are hired to play relatively short gigs (1-2 hours) during different parts of the day - from morning until late night. It allows us to schedule two and sometimes three events on the same day. Moving the time by even 30 minutes in either direction can greatly effect our scheduling for that day. Please be ready to pay an inconvenience fee for the shift of the timeframe. 13. Do you accept credit card payments? - We accept checks, cash and paypal payments. For large companies we offer a way to pay the deposit and balance by credit card. It is a 3 steps process and it involves a 5% booking fee that is charged by that website that processes the credit card payments for us. Please email us with any additional questions. 14. Can you stroll while playing? - Most of the time we are stationed in 1 or 2 locations permanently for the night. Strolling among guests can be dangerous and inconvenient for both guests and musicians. Most of the instruments that are part of our group do not allow us to stroll (upright bass, cello, guitar with an amp, drums, electric keyboard, etc). In some exceptional cases we could consider it for our violinist. It should be discussed in advance and arranged in such a way that there is no danger to anybody involved. 15. What is your overtime policy? - We always make our best effort to accommodate you. If we are available to stay and play over time we will let you know. We will also let you know how much it will cost. However, due to our busy schedule, we cannot guarantee you the over time availability. 16. Can we decrease the performance time after we already booked you? - As much as we would love to accommodate you with this request unfortunately we cannot decrease the amount of the performance time and give you a refund once we are already hired for a specific duration. At the same time if you hired us for 3 hours but your event only requires music for 2 hours we will easily adjust to this new time frame. However we will not be able to give you a refund and will expect the full payment as per original agreement. 17. Can we decrease the amount of musicians than what we booked originally? - As much as we would love to accommodate you with this request unfortunately we cannot decrease the amount of musicians and give you a refund once a specific combination of instruments was hired for your event. At the same time if, for example, you hired 3 people however later you realized that you would only like to have 2 perform we will easily adjust to this new requirement. However we will not be able to give you a refund and will expect the full payment as per original agreement. 18. Do you need lodging? - Most of the time, unless we are on a concert tour, we do not need lodging. In some cases if it looks like we need lodging in order to play at your event we will let you know it during the negotiation stages. 19. Do you need parking? - Yes, we do need to be provided with parking. We usually need parking for 1-5 cars depending on the number of musicians that are playing. 20. Why do you need parking? 21. My event is taking place in a downtown of a big city. Parking is very expensive there. Is parking requirement negotiable? - In some rare cases (expensive valley parking etc.) we could decrease the amount of cars that we are arriving in (3 musicians arriving in 1-2 cars). These situations should be discussed beforehand and put in the contract. Otherwise we assume that parking is provided for us by the client as our contract states. 22. You are offering musical entertainment in several big cities. Can you guarantee us the highest level of entertainment / professionalism in all of these locations? - Our group has been in business for more than 12 years. During this period several members have relocated to different cities. This allowed us to offer the same great music in several locations. The performers that will be playing at your event “graduated” from our group and are now providing the same great music in your city! That is why we guarantee you the highest level of performance and professionalism in all locations where we offer our musical services.